If there is a 3G connection tonight the winners of the 2007 African ICT Achivers awards will be twitter’d live right here, so start following. With 3G down more than it’s up over the last couple of days it has been tough to get most things done. Been Quirking with most of the available 3G time. Attended the African ICT Achievers Awards Finalist Breakfast where each of the finalists received a gift from Vodacom and a nicely framed certificate. If only Vodacom’s 3G network worked all the time, they could keep the gifts. The African ICT Achievers breakfast and African ICT Leaders summit, which soon followed, were both running very late due to Jozi traffic causing most of the attendees to be late. 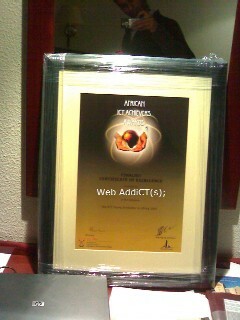 You are able to see a list of all the finalists in the African ICT Achievers Awards 2007 here. The bit of the Leadership summit I did attend really got me thinking. Hon. Etienne Sinatambou from the Ministry of Information, Technology and Telecommunications in Mauritius‘ key note was most amazing. 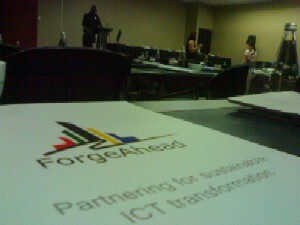 The ICT infrastructural requirements for the continent. Would love to get my hands on the data he presented in his slide show. Eye opening. Talking about Mauritius, Travel Start are giving away a holiday for 2 to Mauritius here. Check it out. I’ve entered 🙂 All the secondary schools have FREE ADSL access over in Mauritius, sweet. Writing this from my Hotel room at the City Lodge – Morningside Sandton. We really need Skyrove wifi hotspots here, all I can say about Wireless G is *Gee* R50 for 60 minutes of wireless internet access? Can you Google ripp off? Who on earth charges for wireless access by the hour? Come on. Why use a dial-up pricing structure for wireless broadband? I’m a Skyrove Wireless Internet hotspot fan. A Skyrove fan I am. Pay for the data your transfer not the freaking time you’re connected. I download emails, do a little IM and spend the rest of the time writing reports and strategy documents. Why do you have to pay the same amount for wifi internet access as someone who streams YouTube all the time? Thank you Imod for the kind words.